So here we are in part II of my Rare Replay/Ultimate/Rare retrospective. We left off with Sabreman in his second adventure, Underwurlde and we rejoin Sabreman again for his next adventure. 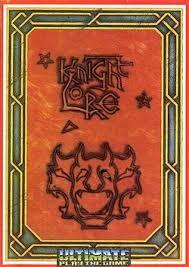 Knight Lore: Released by Ultimate Play The Game in 1984. The game is the third in the Sabreman series. 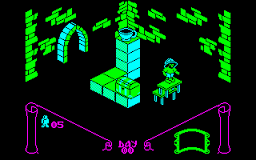 Knight Lore was regarded as a revolutionary game at the time as it was among the first of the “isometric adventure” genre and displayed a detailed 3D world using an isometric perspective. This style was extensively copied by other publishers for years. Sabreman is back, this time tasked to find the wizard Melkhior and search Knight Lore castle to retrieve the objects successively requested by his cauldron. Which objects are at which locations in the castle varies each time you play the game. Sabreman can carry up to three objects at a time and once collected, the objects must be returned to Melkhior and dropped into his waiting cauldron. Successfully following all of the cauldron’s requests within a forty (in game) day period frees Sabreman from the curse of lycanthropy cast upon him by the Wulf encountered in Sabre Wulf. Oh yeah, I forgot to mention that Sabreman is a werewolf…or werewulf. The curse even plays an important role in game-play. Sabreman will periodically be transformed into a werewulf as day turns into night. Certain enemies will only attack if you are Sabreman or the werewulf. Plus some of the rooms and puzzles can only be solved depending on whether you are Sabreman or the werewulf. There is plenty of platform hoping, hazards and enemies to avoid along the way as you gather the items needed to break the lycanthropic curse. Amstrad Action described Knight Lore as a “stunningly original concept” and praised its addictive game-play. Your Sinclair magazine called it “one of the most important (and best) games ever written for the Speccy”. Knight Lore still has a favourable and strong reputation even today, Edge described it as representing “the greatest single advance in the history of computer games”. So far, every Ultimate game has been pure fired gold. But can their next game live up to the standards as we leave Sabreman behind. Gunfright: Developed for the ZX Spectrum by Ultimate Play The Game in 1986. Gunfright uses the same isometric used style used in Knight Lore, only this time instead of screen switching, the view now scrolls. With you playing as Sheriff Quickdraw, who has been asked to track down and capture a band of outlaws who are terrorising the town of Black Rock. The game starts with a short mini-game, in which bags of money drop down the screen where you use your cross-hairs to target and shoot to bags to gain cash. The cash can then be used buy ammunition for the main part of the game. The main action mostly takes place within a scrolling 3D/isometric environment. Streets and buildings are rendered isometrically and the walls of the buildings disappear to outlines when the player enters a building or walks behind a wall so you can see what you are doing. You, as Sheriff Quickdraw must explore the map to find the wanted outlaws one by one. Once you find the wanted outlaw, you enter a duel mode where the action again shifts to the targeting mini-game from before. 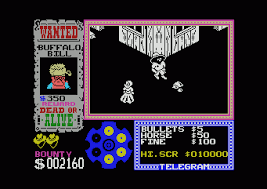 This time however, the player must try to shoot the rapidly moving outlaw as quickly as possible. If you successfully shoot and stop the outlaw, a bounty is paid and a new outlaw enters the game world. During game-play, you’ll often encounter helpful townsfolk who will often point the way to outlaws and where they are hiding. But the player will have to pay a fine if any are shot by the bandits or even the player themselves. Some outlaws will use a horse and you’ll may have to saddle up to pursue them…using a fake horse shell with your feet sticking out the bottom. There are 20 levels (or outlaws) to complete and feature well known names such as; Buffalo Bill, Billy the Kid, Sundance Kid, Jesse James, Butch Cassidy, Ma Barker and others. Once again, Gunfright met with positive reviews with CRASH giving the game a 97% score. Not was well received as previous Ultimate games though. As we let the sunset on the Wild West, time to move onto a chiller climate as Ultimate become Rare Ltd and release their frost game for the NES, which marks the start of one of the moist successful team-ups in gaming history. 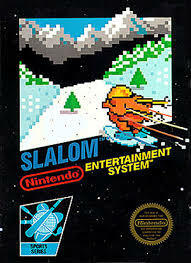 Slalom: Developed by Rare for the NES in 1987, Slalom was a simple racing game that featured…wait for it…skiing, well slalom to be precise. This was first game released under the Rare label after Tim and Chris Stamper sold the rights to Ultimate: Play The Game to U.S. Gold. 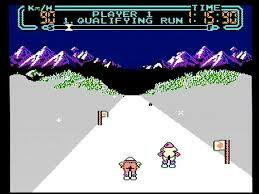 An easy to follow game (unlike most of their previous work) as the game only really involved you skiing down a mountainside against the clock, while you had to avoid obstacles and other skiers. There was a light slalom element added by skiing through the flag markers would give you a speed boost and going around them would slow you down. You could also jump off moguls and perform tricks while airborne for extra points, but doing this would slow you down and make you lose valuable time. There really is not too much to this game at all, it was a simple racer involving skiing. The game has become somewhat infamous on the interwebs community for the main character’s rather impressive rear end. The game met with mediocre reviews and reception (for the first time in this retrospective) with many reviewers calling the game a “rush job” and noting the overtly repetitive and uninspired game-play. Rare would continue to work with Nintendo for their next game too, but would it be any good? R.C. 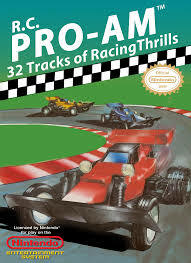 Pro-Am: Released in 1987 for the NES by Rare Ltd. Using an isometric viewpoint with you controlling radio controlled (RC) cars around a series of various tracks. This game spawned sequels and remakes over the years. You control an RC car around a total of 24 tracks against 3 CPU controlled opponents. For every race you complete, you receive a trophy. With larger “High Score Trophies” and even a “Super Trophy” to collect along the way. Throughout the various tracks you’ll find several bonuses, pick-ups and tune-up items to collect by driving over them; such as turbo acceleration, “hotter engines” for higher top speed, and even “super sticky tires” to improve traction. You can also collect weapons that can temporarily disable other vehicles; missiles will take out the opposing vehicles from the front, while bombs take them out from behind. Roll cages protect cars from crash damage, “bonus letters” give players large point bonuses and the ability to drive an upgraded car if they can spell “NINTENDO”. There are also various hazards to be avoided; oil slicks which cause cars to spin out, water puddles will slow you down and pop-up barriers which crash cars. You can even upgrade from a standard RC truck to a faster 4-Wheeler and then to the fastest Off-Roader. R.C. Pro-Am met with positive reviews with many commenting on the varied game-play and upgrades. 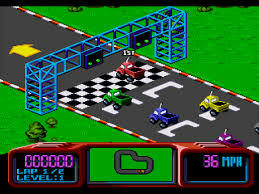 Computer Gaming World called it “a compelling, innovating approach to car racing video games”. 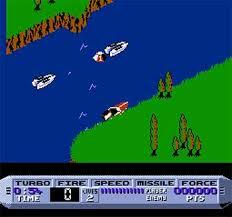 It’s often fondly remembered as one of the better NES titles, even today. Game Informer put the game at number 84 on its “Top 100 Games of All Time” list in August 2001. IGN listed the game as the 13th-best NES game of all time. After the disappointing start to the Rare/Nintendo team up that was Slalom, R.C. Pro-Am proved there was a possible future, so what’s next? Cobra Triangle: 1988 saw the release of Cobra Triangle from Rare Ltd for the NES. Again using that isometric viewpoint, but this time controlling a speedboat through varying missions and tasks. You control a cannon-equipped speedboat against other opponents through 25 stages of varying objectives; winning races, removing mines, avoiding obstacles and saving swimmers. Races are pretty self explanatory, reach the finish line before your opponents and before the timer expires. Removing mines is as simple as picking up a mine and taking it to a designated area. Rescuing swimmers tasks you with picking up swimmers before they are abducted by the enemies. The player can attack other competitors with the cannon, go airborne via ramps, and pick up power-ups that will improve your speed and weapons. In upstream races, you must avoid logs and whirlpools too. Cobra Triangle had high praise upon release, reviewers praised the graphics and varied game-play and diversity of the levels. 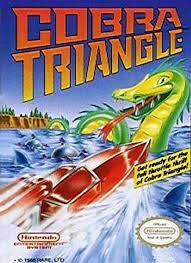 GamesRadar named Cobra Triangle among the top NES games of all time. Often looked back upon as one of the better and more interesting NES titles. Well, here ends part II with the Rare/Nintendo team up finally paying off and producing some quality and fun games. Part III will see the Rare/Nintendo joining only get better, as well as the return of some memorable franchises. This entry was posted in LBoG: Retrospectives and tagged Cobra Triangle, Gunfright, Knight Lore, LBoG: Retrospectives, Little bits of gaming, NES, R.C. Pro-Am, Rare, Rare Ltd, Rare Reply, Sabreman, Ultimate play the game on 04/08/2015 by Steve Perrin.